Another model done, which is good, and the crew grows; I still have two more minis to add to it. That said, this was a pretty disappointing casting once again, with a partially-unformed lower hand where it was supposed to grip the bat, and some big lumps of metal (too chunky to be called flash) under the arms. In all, the weakest paint-job of my weekend's three finished minis (although the photograph seems to have washed out some of the highlights unfortunately), but another one done, which was satisfying after April's painting slump. In game terms, when compared to the first Goon I painted, with identical skills values, identical Personal Trait (Brutal) and near-identical cost, there does not seem much between that model and this one. Goon (the first one) has Brass Knuckles, dealing 2 Stun with Strength 4+. 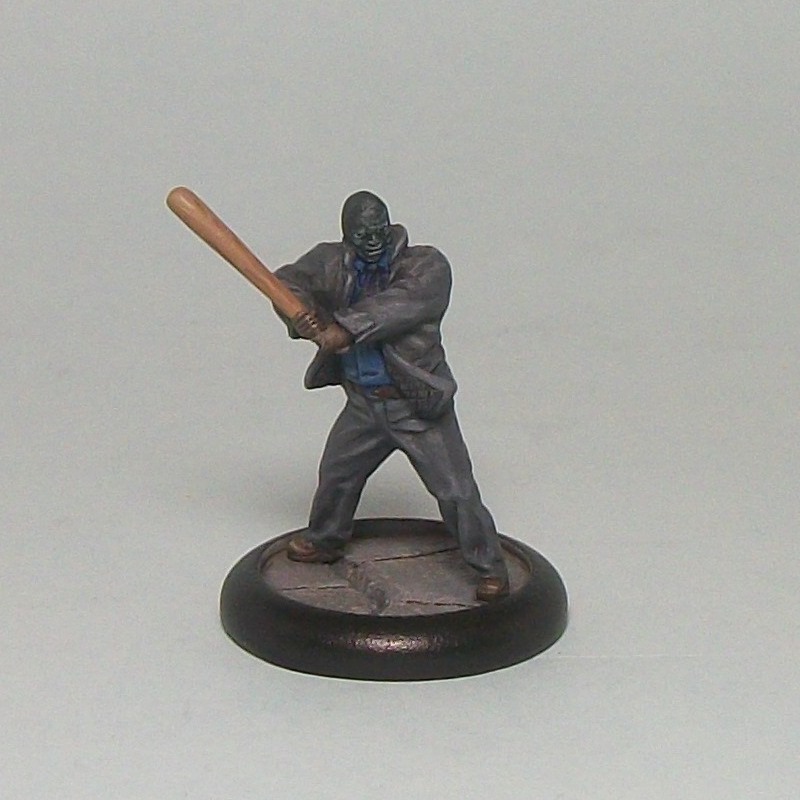 Goon 2 (this one) has a Baseball Bat, dealing just 1 Stun, but with Handy (re-rolling misses) and Heavy (adding +1 to the Strength value, meaning Damage on a 3+. All very much of a muchness? Apply a little maths and it appears that each has a subtly different advantage to the other. Overall Goon (the other one!) is better at taking models down based on basic Damage output, simply due to the superior Stun output. However, Goon 2 (this one!) has an advantage of generally producing more hits to match against the critical die. Goon 2's best role though, is probably in taking out KO minis, since he should achieve more hits against them (thanks to that reroll), and the surplus Stun of the Brass Knuckles is then redundant. Stuff for me to remember when fielding my Black Mask crew! I can see a tag-team of sorts with the two models: Goon attacking first, and if a model is KO, maybe using Goon 2 to try and convert Stun to Blood. We shall see how it plays out I guess. 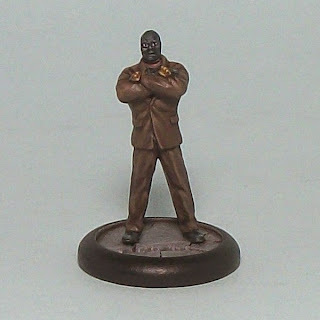 After yesterday's post of Black Mask, another Henchmen down, and one that can be used for either my Poison Ivy crew or my planned Black Mask crew. Prisoner 04 is probably closest to the first Goon for comparison purposes among the minis I have painted so far. 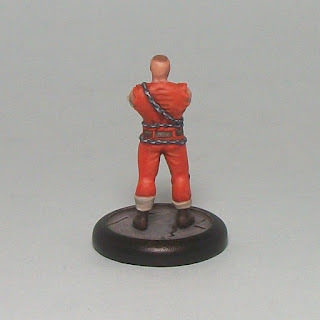 Prisoner 04 costs 2 Reputation more between the two. Both are equipped with Brass Knuckles and have the same Willpower, Movement, Attack, and Defense. Goon has better Strength (more likely to injure targets) and Prisoner 04 has better Endurance, meaning he lasts against Damage a little longer. However Prisoner 04 benefits from Criminal, meaning *if* he can KO or remove an enemy as Casualty, he increases Willpower by 1 point, which is very useful. 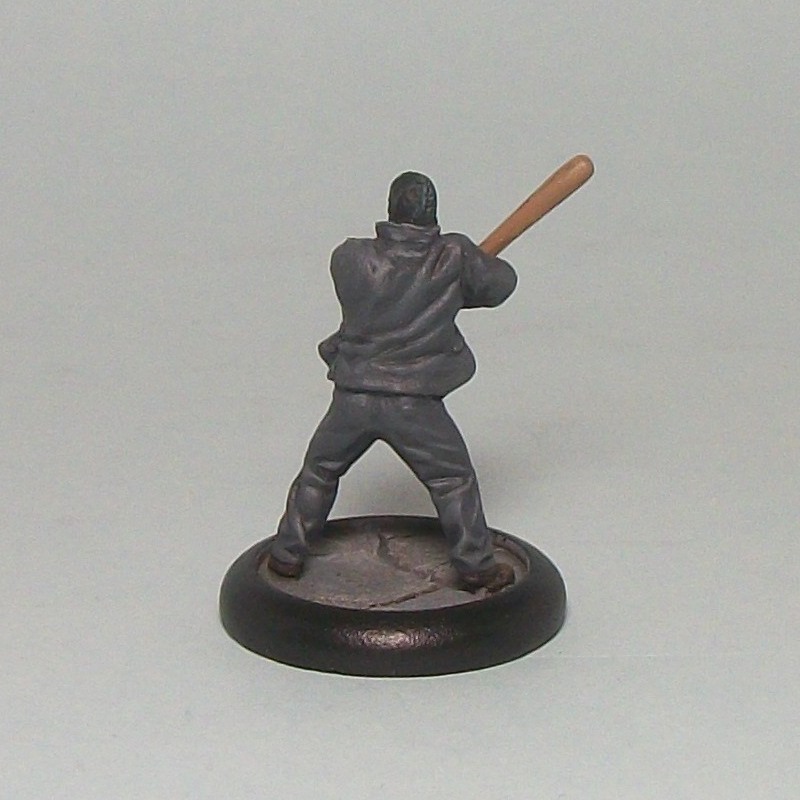 He also has Bodyguard, allowing him to take hits for better models. To benefit from Criminal he needs to get the decisive blow, and more importantly, in trying to do that he is less likely to Damage than the Goon. In all, I think Goon is simpler option, and because of that, the kind of model I will get more in-game value out of I suspect, until I get to grips with the game more. That said they will both get table time, but I already suspect Goon will be slightly more effective for me at first. More importantly, I am another step closer to having a playable Black Mask crew. Black Mask is my third BMG Leader, opening up a second crew option for me. Poison Ivy has too many downsides at present for me to try to get to grips with (immobile Henchmen unable to score Objective VP's, and that are vulnerable to becoming one-shot Casualties with the right Special Attack; other Henchmen cannot benefit from equipment upgrades; a tricksy Leader used with less-than-effective Henchmen), so I settled on painting up a Black Mask crew, supplemented by Riddler, Deadshot, and some Blackgate Prisoners. Now my evaluation of Poison Ivy may be harsh, but for now, she is not for me. So I am hoping Black Mask better fits my approach to games, and has fewer in-built Henchmen limitations to overcome. Tackling Black Mask was surprisingly quick by my standards. I knew from the outset that I was not going to try pin-stripes - too fiddly for me. I wanted a simple white suit with some dark contrasts, kind of influenced by Archangel from 80's action TV show Airwolf. 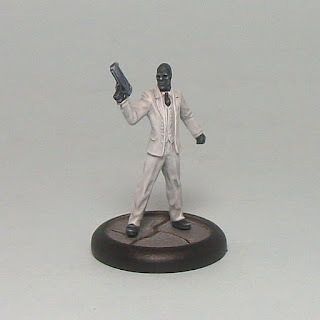 I only started Black Mask after commencing work on a couple of other minis, but pretty quickly I had the bulk of him done, and I am happy with the final look. Simple but satisfying. Moving forward I ideally have another four minis to finish. One is finished (posting him tomorrow), and two are part-painted. I am hoping to give the crew a run-out in mid-June to try and get some practice in before my second BMG tournament at Titan Games. The pressure is on! The first mini completed for my Black Mask crew. 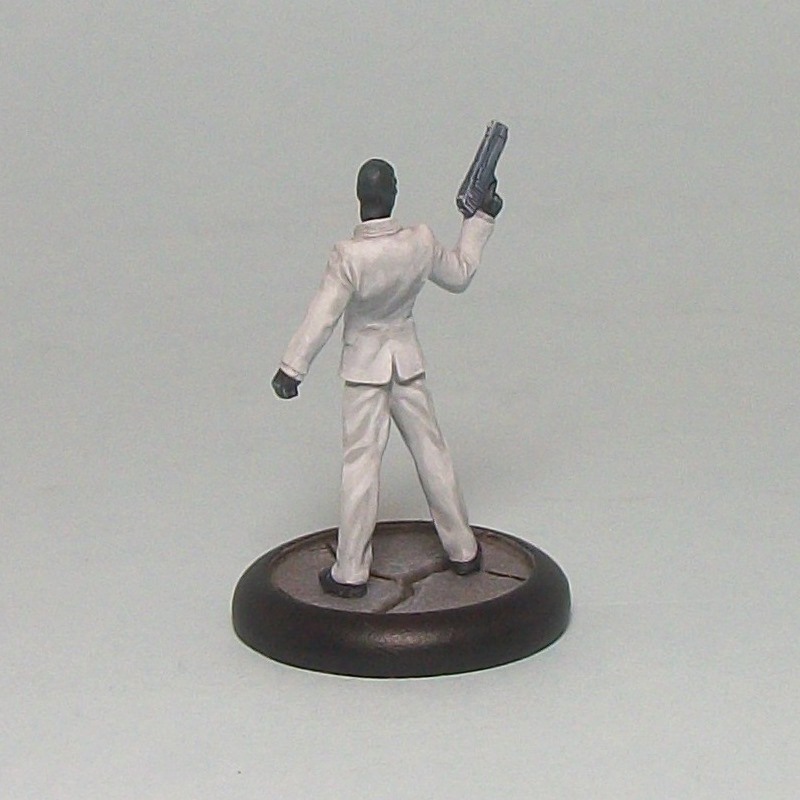 A very simple paint-job, but that is exactly what I needed after losing a lot of painting momentum recently. And choosing not to bother with pin-stripes was basically to keep the paint-work as simple as possible. For this mini, finishing something for table-top readiness was the most important thing. It isn't my best work, but I have been in a painting slump, so I am glad it is done. The rest of the Black Mask Henchmen in suits will have simple choices like dark grey, dark blue etc. The sculpt is far from the most exciting pose I have seen. Also, as with many Knight Models minis I have the metal was softer than I am used to, and the casting was a bit rough in places. Sorry to say, but for me the quality control in production by KM does not match the premium price-point for their products. There are others who have been very satisfied, but for me, their casting is nowhere near the industry best. That said, and in the interests of balance, I know of others who have had no such issues, so maybe I have just been unlucky. With the pose and the QC issues considered, the reason for me buying and pressing ahead with the mini is that Henchmen are vital to play most viable BMG crew configurations. 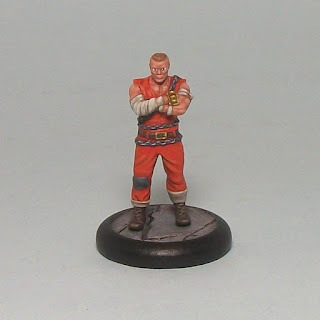 Going forward I hope to finish one or two more BMG minis in the next few days. 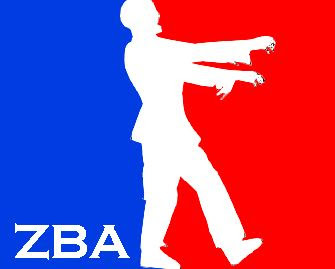 I hope to get in another game in early June, and have a second tournament in late June. War of Wonders Miniature Game Kicktsrater is funded, but needs just a few more backers to unlock its first stretch goal, so I wanted to draw attention again to this campaign. 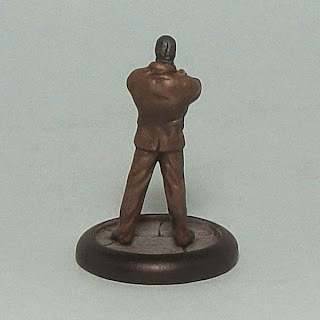 The War of Wonders is intended to develop a range of minis in a Weird War II setting. The weirdness is primarily through the metahumans themselves. There are 4 initial metahumans and 2 squads available, with more unlocked as stretch goals are achieved. 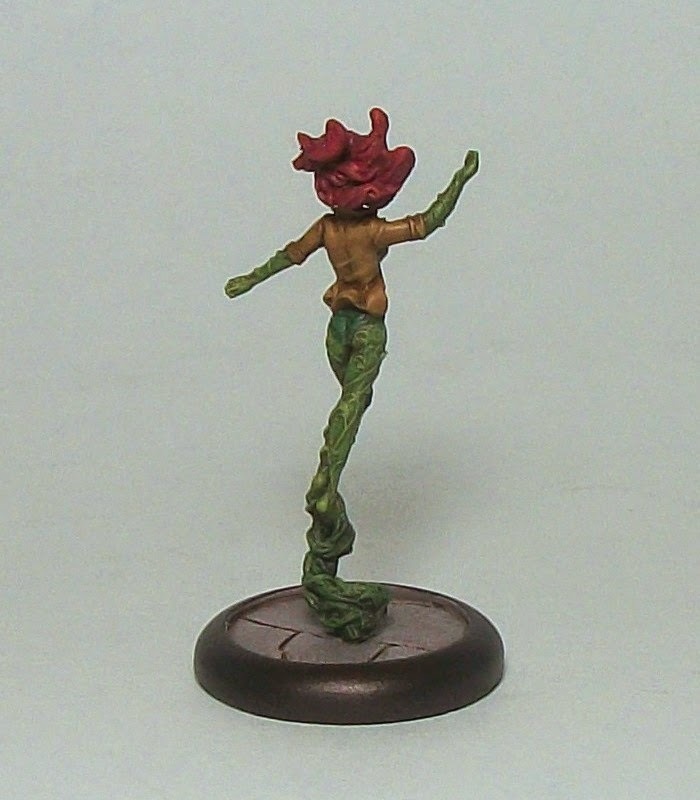 I had originally hoped to get this version of Poison Ivy finished before the March tournament at Titan Games, but time was against me. The first Poison Ivy I painted is the 'comics' version and this is the Arkham City (video game) version. 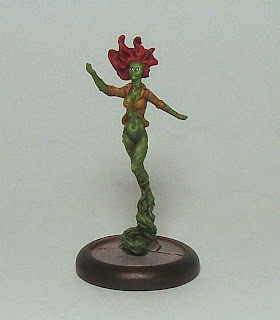 This mini was started, and sat part-painted for a while. During that time, my painting momentum fell off a cliff, as it does every so often. So, recently resolving to get something 'done', I picked up the brushes and managed to finish this mini off. The last iteration of the crew only had 3 models to Manipulate Objectives, so was lacking numbers in that area; this crew has over double that number and has a specialist for Riddles. It lacks the attack-magnet of a big guy, so whether that is a help or a hindrance is uncertain. The crew above may be one I take to my next tournament, although I am still thinking about Black Mask for that, and have started painting some bits up for that. 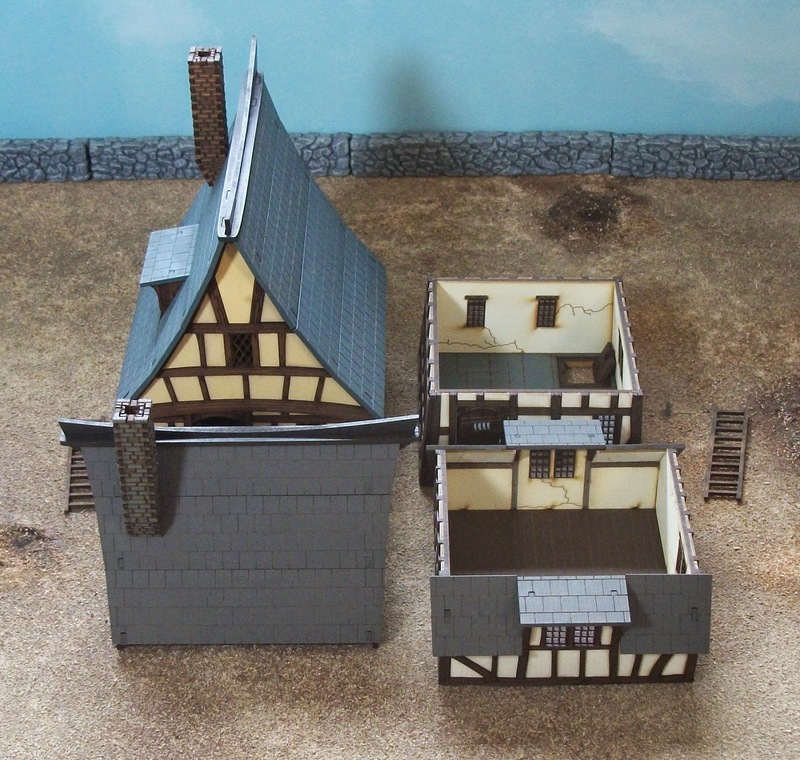 Another two buildings from 4Ground's Fabled Realms range, bringing my total up to 9. I wasn't planning on getting these at this time until I found an Ebay seller offering them at a great price (each was between 22% and 25% off rrp). These will probably be my last two for a while as I want to add some non-residential buildings going forward, plus some more ruins as they get released (unless I can snag another Backstreet Dwelling at a bargain price!). 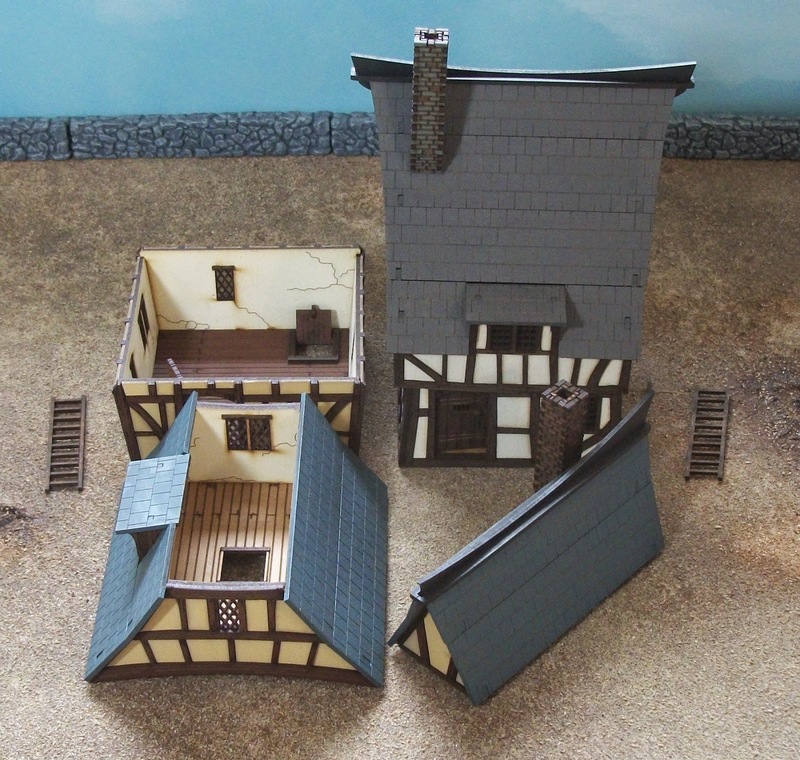 That means my prime targets are the massive Stoic Arms pub, and the Town Watch Tower which is due for release in June. Time to save up some pocket money - in other words don't expect to see them imminently on the blog! The various Fabled Realms houses effectively come in three types: High Street Houses which are the 'middle class' homes of the city; Dockside Houses represent the grand quarter and most expensive dwellings in the city, owned by traders and wealthy citizens; and Backstreet Dwellings which are the simple dwellings of most citizens. 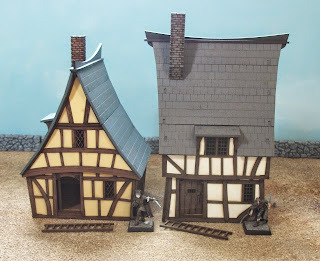 These are two more High Street Houses, and the larger one is the intact version of a damaged building (click for link) I built a while ago. The larger building is High Street House 3. It took approximately 3 hours to put together, so a little longer than the undamaged version. Of course it has more cladding to add in, as well as door and chimney etc., so overall more work required. The other, smaller, building is High Street House 4; this one took approximately two and a quarter hours to build. As usual, with both builds I started with the first stage of each sub-assembly before moving to another sub-assembly to allow drying time. I over-painted the tiling on the roofs to cover the scorch marks of the laser cutting process. Obviously that adds more time, but in all still a hell of a lot quicker for me than going the route of a scratch-build. I have really, really enjoyed putting these things together, and think it will be worth it when they get some gaming time. I wholly recommend this Fabled Realms range to anyone who is thinking about picking any of them up. For me, the price is right for what they offer, and it is nice to have a varied array of buildings that still have a recognisably consistent style. I am planning to scale back the Kickstarter projects I back this year, but as this is supers-themed, it is hard for me to pass up. A modest goal with a chance of making it, so I am in. I will probably only back for the 'metahumans' and not bother with the squads. They should also have remembered that 'superheroes' is trademarked, so hopefully that won't hurt them. As Rob and I sail towards the shores of our first games of Freebooter's Fate, I have been devouring the rule-books to try and understand the game as much as I can ahead of time, to try and make things easier since neither of us has actually played the game yet! One of the things that has emerged is that as much as I love the books, with their abundance of evocative tales of heroes and more often ne'er-do-wells and skulduggery, that with each new book comes new characters, with different kinds of abilities. And with each new book comes a 'New Traits' and 'New Special Actions' section - the latter are Actions that characters can only use if they are written on their card. The problem is, that some of these new abilities are included in specific character write-ups, and not the main text, and worse still, the Mystic Spirits book does not feature an index! Here I plan to gather and update as needed a small index of New Traits and New Special Actions, and page references where they can be found.